Many Mahayanists, but especially Vajrayana Buddhists, utilize images of buddhas and bodhisattvas in their practice. Tibetan Buddhism especially, is famous for a highly developed iconography used to express aspects of the existence of the Buddha and his teachings (known as the Dharma) in scroll paintings called tangkas [sometimes spelled thangkas.] Also, cast metal, wooden, clay, plaster, "resin," and stone images (Skt. rupa, form) are used on personal shrines, in temples and in teaching centres. This article introduces some of these figures, whose origins and qualities are derived from Buddhist scripture and from the legends told about the efficacy of their activity as a means and support for the enlightenment of all sentient beings. There is an introductory page on female deities, one on the wrathful deities, and several pages on individual deities, too. In Buddhism, the deities perform different types of functions for the practitioner. They may be a focus or aid to individual meditation and transformation, in which case they are called yidams, or they may function as a protector of the dharma and/or of an entire class of being. It is important to understand that the precise meaning varies according to the view of a particular school and/or lineage. In all cases, deities are understood as means for liberation and the enlightenment of all. For example, although a female deity such as Ushnishavijaya is known as a bestower of longevity, her purpose is not simply as a personal protector, but as a way to liberate numberless individuals via the extended life of just one. In accordance with the disciples, the place and the time. In a 1982 interview, HH Dalai Lama was asked about Westerners' possible difficulties relating to deity practice: "Some say that . . . symbols and deities should be altered so as to correspond with those of our own culture." His response: "This cannot be. If you follow Buddha-dharma, the deities meditated upon should have a sound reference to the teachings of Buddha Vajradhara. They cannot be arbitrarily created nor can they be blended with those of other methods. It is best to follow with diligence the path most suited to you. If you choose Buddhadharma, practise it purely. Then, if you achieve its results, fine; if you mix practices and achieve nothing, you shouldn't blame Dharma. Of the various Buddhist meditational deities, the best is Buddha. If you like others, practice them; if you don’t, simply take Buddha." Buddhas, and bodhisattvas -- those who in the process of becoming fully enlightened and who out of compassion, choose to stay and help those caught in the cycle of existence -- are thought to be accessible to us in one way or another. We can know and identify them by way of the visions of advanced practitioners who have described them for us in a picture or in words so that we can relate to them. Fully enlightened beings are thought of as having the capacity to exist in three levels of reality. The levels are often thought of as hierarchical, but whether one experiences a dharmakaya, nirmanakaya or samboghakaya form is generally considered to depend upon one's own capacities. According to the Tibetan Buddhist tradition, Buddha Shakyamuni taught the tantric approach, or Vajrayana including the use of deity practices, in a fourth Turning of the Wheel. In particular, he transmitted the Kalachakra and/or Guhyasamaja tantras. The Guhyasamaja (Tib. sangwa-dupa) which focuses on the primordial buddha Akshobya is believed to be one of the first Sanskrit works to be translated into Tibetan. Holding a vajra, bell, wheel, jewel, lotus and sword, this deity symbolizes the essential unity of all buddhas. Why call them deities; why not gods? Although the word deity was originally a synonym for god, experience has shown that some practices such as those performed by Buddhists consist of a type of address in which the intent is rather different from the usual ancient one. That is, the general intention is not to propitiate; not to flatter, placate or enter into contracts. There is another important difference between Buddhist deities and mythological gods or goddesses. The latter are, or were once, considered real -- described as motivated by jealousy, power and other appetites and not very different from physical creatures such as people. The deities of Buddhism are ultimately regarded as manifestations of Emptiness. Some practitioners eventually abandon deity devotion as a method for attaining an enlightened state when it has outlived its utility. In fact, Atisha is supposed to have remarked, "We Indians do the practice of one thereby accomplishing all of them; you people do the practices of so many, and so accomplish none!" When deities are depicted in sexual union (called yab-yum or father-mother) this symbolizes intimate union of another type -- that of skill and compassion, or Means and Method, or Wisdom and Emptiness. Some well-known Buddhist deities are Amitabha (Opameh, in Tibetan), his emanation Chenrezi (Avalokiteshvara in Sanskrit) and Tara, the female bodhisattva (who is also a Buddha) called upon particularly in times of distress. Kwan Yin (or, Gun Yom,) beloved by Buddhists of east Asia, is a combination form with the qualities of both Chenrezi and Tara. One category of venerated beings consists of the 16 arhats (Pali: arahant) or disciples of the historical Buddha. They are shravakas or "hearers," believed to be among those present at the first Buddhist council. (The link is to line drawings and descriptions at Buddhanet.) In the Chinese tradition, they number 18 and are called the Lohan [Luohan>arahan>rahan>lahan] an expression that has also come to mean "vegetarian" when it appears on a restaurant menu. In some other languages they are called Rakan. According to one scripture, Buddha Speaks of the Amitabha Sutra, Shariputra is told that there are innumerable Buddhas [<see notes at the end for a list of Buddhas mentioned.] There is a convention, however, in which there are considered to be five transcendent Buddha Families. All the buddhas are manifestations of Emptiness, but they have distinctive samboghakaya forms. Once referred to as the Dhyani Buddhas (Lama Angarika Govinda's Foundations of Tibetan Mysticism) each family has a chief figure who is associated with a cardinal direction (plus the zenith or Space) and is considered the head of a family. The families are: Tathagatha or Buddha family, Vajra, Lotus, Jewel, Karma. Besides the symbol, eg. lotus, vajra, etc. each has a characteristic colour and a female consort also known as his "method" or actualizing manifestation. Each can be seen as representative of one of the "heaps" or skandhas, and each is also associated with one of the Realms in the Wheel of Rebirth. Each is believed to inhabit a Pure Land or "heaven." These Buddhas also embody aspects of Enlightenment. For example, Akshobya is considered Enlightened Mind, Vairochana is Enlightened Form and Amitabha Enlightened Speech. And the practice of each of the Buddhas is thought to act in such a way as to offset one or other of the negativities characteristic of beings, such as anger, pride, ignorance, fear or desire. The historical Buddha is seen as only one manifestation in a chain or series, a nirmanakaya form of one or other of the Transcendent Ones. For Buddhists of the Kagyu denomination, the very dark blue Buddha of the Center, or of Space in the form known as Vajradhara, is the source of enlightening method. In his role as purifier and preceptor, he appears as princely white Vajrasattva holding a dorje and a silent bell. Vajradhara and Vajrasattva are also sometimes interpreted as forms of Vajrapani, who is a bodhisattva of Amitabha's family. Namo bhagavate Akshobhyāya tathāgatāyārhate samyaksambuddhāya. During the 1st North American Kagyu Monlam (July 2010 at KTD, Woodstock, NY) led by Khenchen Thrangu Rinpoche, participants learned that the recitation of the Akshobya mantra can be of special benefit to our sick and /or dying animals by keeping them from rebirth in lower realms. Akshobhya is associated with All-pervasive Consciousness of which deep space or the profound ocean is a symbol. Indeed when he is depicted with his consort, Lochana, she is pure white like the foam of the waves. The stain or obscuration (Tib. klesha) that he neutralizes is that of anger. Hum (Tib. Hung) is the seed syllable of his mantra. Akshobya as depicted by Andy Weber. 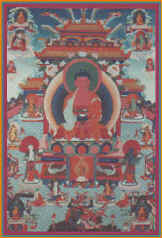 Amitabha (Tib. Opameh) is the Buddha of Infinite Light, the one among the ultimate Buddhas thought to occupy the Western direction of space. He is associated with the element of fire and with overcoming the klesha of fear. Hrih is his seed syllable -- the one associated with the heart center. The emblem of the red Buddha of the West is the lotus, and Amitabha with a benevolent smile sits in endless meditation (dhyana) holding a food bowl, under a tree by a lake, with peacocks supporting his throne. The bowl in his lap contains the ambrosia of eternal bliss. In many cultures, but especially in Japan and China, he is thought of as the ruler of the Western Paradise where the virtuous will find themselves after death. This lush and be-jeweled land is illuminated as if by the setting sun so that everything is a golden-red. In some depictions, he is shown making the abhaya mudra with his right palm facing us in the familiar 'stop' gesture which here may be interpreted, ‘stop being afraid’, that is, a gesture of protection. His left hand may be in the gesture of granting blessings or wishes. Sometimes he is depicted holding a red peony. Where ever people feel helpless in the face of life's circumstances, his cult is very popular. In many parts of the world devotion to Amida, as he is known in Japanese, developed into a school of Buddhism in which it is considered unnecessary to do any other practice but repeat the mantra of Amitabha. Indeed, in some sects the mantra written in calligraphy, is itself, an object of worship. The Western paradise of Amitabha is called Sukha-vati in Sanskrit, or Blissful Land. However, in the conventional translation from Chinese and Japanese it is known as "The Pure Land" despite the fact that there are many other such Lands, and so the form of Buddhism just described is known as Pure Land Buddhism. Pure Land Buddhism centres on his practice or even merely the recitation of his mantra: OM Ahmi Dehwa Hri, but Sukhavati (Realm of Bliss) which is the name of his pure land, is mentioned by all Tibetan Buddhists in many different circumstances, most especially at the time of dying. HH Chetsang Rinpoche of the Drikung Kagyu on Amitabha's Pure Land of Dewachen (Sukhavati) with questions and answers. Other transitional events -- any beginnings or endings, if only of the Western somewhat arbitrary calendar system -- are often occasions for uneasiness. Thus, at the request of several world communities, the sadhana or ritual of worship chosen by Tibetan Buddhist centres for the time just before New Year's 2000 was the Maha Sukhavati text concerning Amitabha. Amitayus [Tib. : Tsepameh] is an expression of Amitabha. His distinguishing attribute is a flask of amrita which heals any illness and confers immortality. Vairochana (Tib. pronunciation Berotsana) whose name means Radiant is the patron of the Gelugpas. As such, he will occupy a central position. Otherwise, like the rising sun that illuminates darkness, he is considered to occupy the East and his colour is white. He stands for wisdom in the form of understanding. His method overcomes ignorance or delusion. His vehicle is the lion, symbol of the royal lineage of Shakyamuni and the superiority of the Buddha dharma as a method. This is the Buddha as Teacher; he makes the turning wheel gesture (dharmachakra mudra) which evokes his sermons and his setting in motion the system compatible with the wheel of rebirth. Om is the syllable associated with him. He heads the Buddha family. Ratnasambhava means Jewel-born. Associated with the South, he is golden yellow, and earth is the related element. He is associated with the riches of the earth and the realm of earthly existence. His attribute is a Wish-fulfilling Jewel (Skt. chintamani) the stone of mythology that usually grants 3 wishes. Here it grants our "heart's desire" which is to be always happy; that is, to put an end to suffering by means of the Dharma. He heads the Gem family and his way of liberation is via sensation and emotion. He helps overcome craving and greed. Ratnasambhava's throne is supported by horses. He makes the boon-bestowing gesture (varada mudra) with his right hand. The seed syllable of his mantra is Tram. Practices associated with him work to transmute the poison of pride. Amoghasiddhi (Unerring Achiever) is called Donyo Drupa in Tibetan. He is dark green, and is associated with the North. His practices overcome envy and jealousy. He is associated with the air and with our mental attitudes. His symbol is a cross formed by two vajras (Skt. vishvavajra) and his seat is supported by shang-shangs or "garudas". With his right hand he makes the gesture, "Do not fear" (abhaya mudra) which is also sign of complete refuge or protection. His seed syllable or bija is Ah. He overcomes through introspection, meditation and the use of the breath. See the 5 orders of Dakinis. In Tibetan, he is called Kuntu Zangpo; Puxian in Chinese, Fugen in Japanese. Notably associated with the Dzogchen lineage, but invoked by most others, Samantabhadra (Skt. : samanta means, "all-pervasive," or "universally extending" and bhadr' means "fine" in the sense of well but also pure and the best) is the source of buddha-manifestation according to the Nyingma. He is the sublime source of all compassionate benevolence and generosity. As a deity, in may respects he is the one who most resembles an idealized view of the Deity in the contemporary Western world. His mount is an unusual elephant whose six tusks represent the Paramitas: Charity, Morality, Patience, Energy, Meditation, and Wisdom. He is usually depicted in the indigo of deep space, embraced by his consort, Samantabhadri, who is pure white in colour. Khenpo Karthar tell us that kuntu means ultimately and zangpo means goodness, and his name implies that he is primordially free of any fault, stain, or delusion so that not only is he currently pure, but in the future, he cannot be defiled. Rinpoche explains that Vajradhara is another way of referring to that same, essential nature. ~ "The Aspiration of Samantabhadra," trans. Lama Yeshe Gyamtso and Dzogchen Ponlop Rinpoche. In the Tibetan tradition, several types of figures are used as a focus for practice. Among them are found the so-called meditational deity or yidam, the lineage teacher or guru, the dharma protector who acts to overcome spiritual obstacles, and the dakini. All may serve as models of inspiration, as bestowers of grace or blessing, and as guides and protectors. Yidams are sometimes referred to as tutelary deities. The "personal" deity or yidam is usually assigned by the spiritual mentor, guru or lama in accordance with the student's personality and life circumstance or karma. Sometimes it is said that the yidam chooses the student. The choice can be made in any of several ways. Through dedication to, and the ritual observance of a yidam, habitual tendencies and inclinations can be modified or overcome. Karma Kagyu 3-year retreatants currently have Karma Pakshi, the 2nd Karmapa (1203-1283) as their yidam. To summarize, in the Buddhist view the Dharmakaya is uncontrived, spontaneous and pure, hence all deities have the same essential nature, but they manifest or display in the various forms only for the purpose of taming particular beings. As the Dalai Lama said, above, we can practice with all of them by practicing on one. The thing is, to practice! The great teacher Atisha is reputed to have said, "We Indians practice on one yet accomplish all of them; you people practice on so many, but accomplish none!" Kuvera or Kubera (Tib. Namtseh) is also the Hindu god of wealth, and possesses the Jewel-spitting Mongoose. Mythology holds that he was a thief in a former existence. In the Buddhist context, he acts to serve and disseminate the Dharma. Sometimes Jambhuvala, King of the North, also known as Vaishravana, Dzambala or Zambala (Tib. Norkyong Chenpo) fulfills this enriching function. (There are 3 other guardians of direction.) He can often be distinguished from Kuvera by the fruit he holds. His mount is a snow lion in some traditions. Dhritarashtra (Nation-protector) is the Guardian King of the East. He is the ruler of the class of celestial entertainers known as the Gandharva. As such, he is depicted with his lute. In Buddhism, music is acknowledged as a medium that can help teach the dharma also subdue negativity. Virudhaka (Bounty Hero) rules the South. In Indian mythology he is lord of the Kumbhanda divinities. In Buddhism, he can increase wisdom. Like Manjushri, he wields a sword. Virupaksha (Seer Hero) is a Naga king who rules the Western direction. He is associated with wisdom in the form of languages. Skanda is the Sanskrit name of a son of Shiva. He is lord of forms and the Indian war god. In Buddhism, he is an associate of Maitreya and a protector of relics of the Buddha. Yama is the Hindu god of Death. He figures in scripture as well as embodying an important aspect of Buddha-dharma. Sangye Menla is the blue Medicine Buddha who holds in his lap the lapis lazuli [dark blue semi-precious stone] bowl of amrita, the elixir of life in the form of an ambrosia which heals all illness. He is an aspect of Buddha, and is often depicted in the company of healing figures of other colours. In Tibetan Buddhism, the sutra known as the Prajnaparamita [Perfection of Wisdom] was deified as an aspect of White Tara. This Tara, sometimes depicted as golden, is also related to the Indian Sarasvati, the deity of letters, music and other intellectual pursuits. Similar to the devotion given Buddha Amitabha is the movement which originated in the teachings of Nichiren who lived in 13th century Japan. He promoted the idea that the text known as the Lotus Sutra was itself a sort of deity having soteriological [saviour-like] powers. This sect is quite popular today in the West. Tina Turner, the successful singer, stated in her autobiography that she owes her success in overcoming a difficult series of life-situations to her daily repetition of the Lotus Sutra mantra: Om namo myoho rengeh kyo which combines Sanskrit and Japanese. Buddhist teachers of all schools stress that all such deities are to be thought of as embodiments of wisdom and compassion, not separate from the practitioner or meditator, and ultimately empty of any inherent qualities. Nevertheless, a Buddhist deity may manifest in four ways: benign, active, semi-wrathful and wrathful. That is, their activity is pacifying, enriching, magnetizing, or subduing/destroying. The four-armed form of the protector, Maharaja, demonstrates by means of his gestures or mudras, all 4. An example of a wrathful deity is Guru Drakpur. This is a manifestation of Amitabha's activity via Padmasambhava as Vajrakilaya, vanquisher of malevolent obstructions [lit.>Sanskrit: indomitable sin-eliminator]. There may be some variety in the description of a deity in the Vajrayana or tantric Buddhist tradition. One reason for this is that sadhanas, or ritual practices of a deity may have appeared, been revealed, uncovered or discovered, via different teachers in different places and times. It was often the case that a practice had a long tradition in South India where the fame of its efficacy and of its masters drew Tibetan teachers/translators to undertake the arduous journey to fetch it for the benefit of beings of northern Buddhist lands. However, sometimes circumstances did not permit its wide dissemination, and it was then concealed or secreted for use at a later time. Re-discoverers are known as tertons, and revealed tantras are called termas. Especially effective or popular sadhanas can exist in a multiplicity of forms as a result of the denomination and/or the distinctive teaching lineage of practitioners. When Vajrakilaya works through the activity of the purifier, Vajrasattva, he is called Vajrakumara (Tib. Dorje Shönnu) or Indomitable Prince. Vajrakilaya is also considered the wrathful embodiment of bodhisattva, Vajrapani, as he acts to subdue, purify and transform the actions of those whether gods, rakshas or people, who seek accomplishment or power for selfish or irresponsible reasons. Visit the Himalayan Art site for many fine examples of Buddhist deities as depicted in painted scrolls known as tangkas. There are a number of gods and goddesses from the Hindu tradition who appear in the Buddhist context. The four high gods: Brahma, Indra, Shiva and Vishnu and their respective Shaktis are integrated into Buddhism. Not all the gods of Hinduism are considered bodhisattvas, but one that is is Ganesha, the elephant-headed son of Shiva who helps overcomes obstacles. When Ganapati in his capacity as a child of the gods is considered a hindrance, he can be depicted as being trampled underfoot. When Indian deities are depicted in poses of humility, this is not to signify a victory of one religion over another, but rather the Buddhist view that a dogmatic position is not tenable. For example, if figures representing Shiva and Parvati are in postures of subjugation, this is a way of "saying" that both Nihilism and Eternalism are untenable philosophical views. *We must stress that the word deity is understood in a rather unique way by Buddhist practitioners. It is used for lack of a better word. The translation "tutelary deity" for the Tibetan yidam is misleading as it implies a teacher-student relation. The term "meditational deity" is now preferred. These figures are understood by a Buddhist to arise and return to Emptiness; they have no inherent reality. They are not worshipped in the sense of idolatry, though certainly it may seem to be so for example, when someone first encounters people doing full prostrations before images on a shrine. That is one good reason for avoiding the use (in a Buddhist context) of the term 'altar', by the way. bodhisattva: beings who aspire to relieve all suffering, foregoing their own enlightenment to do so. Mongoose: The animal is often incorrectly described as a shrew, a mouse-like creature, but it is a small weasel. The animal, immortalized in Kipling's story, Riki-tiki-tavi, is well-known for its quick reflexes that permit the ability to catch and kill snakes, even the cobra.